Graduating from massage school is a tremendous accomplishment. You have proven your competency in the classroom and in a clinical setting. You are on the verge of beginning a new, exciting career. There is just one final hurdle to overcome before officially becoming a licensed or certified massage therapist; the MBLEx. I have talked to instructors and students all over the country preparing for the MBLEx. Test-takers just like you. There are people who have used every website, app, and study guide without success. Fresh students right out of massage school. Therapists taking the exam after practicing massage for twenty-plus years. Massage students with terrific hands-on skills, but the thought of an exam leaves them exhausted from anxiety. 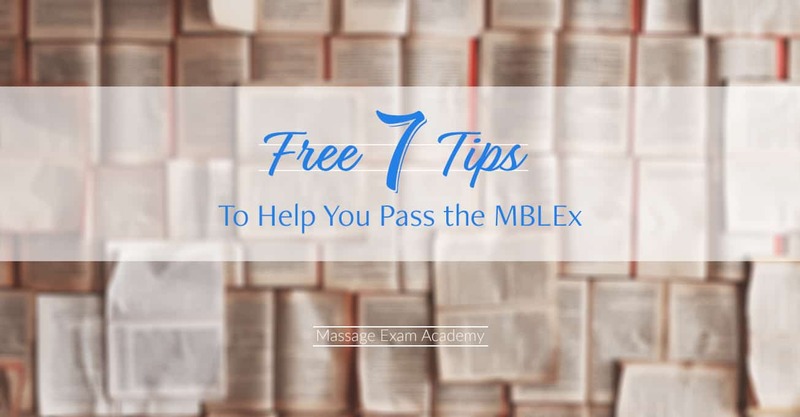 Wherever you are in your MBLEx preparation, these are seven tips I have compiled from years of helping hundreds of members on Massage Exam Academy. This is more than your typical “make sure you set your alarm the night before” advice. These free MBLEx tips are ones I know will help you prepare, gain confidence, and pass your exam if you do your part. Which is a gland the size of a grape? These types of questions are not going to be on the MBLEx. Do not allow yourself to fall into an illusion of competence by using resources that are not challenging you. These types of questions may lead you to believe that you are actually prepared for the exam. So what type of questions should you prepare for? What is the antagonist to this muscle? Not only do you need to know the muscle in the image, you need to know its antagonist. The answer is B, Tibialis Anterior. It is the antagonist to muscle in the image above, the soleus. Choice A: The action of Soleus is plantarflexion. Choice B: The actions of tibialis anterior are dorsiflexion and inversion of the foot. Choice C: The action of gastrocnemius is plantarflexion. Choice D: The action of plantaris is plantarflexion. What if we took this question a step further? What is the insertion of the antagonist to the above muscle image? Now you need to know the antagonist to this muscle and its insertion. So you would need to know the anatogonist and the insertion to that muscle. This answer is A, the insertion of tibialis anterior is the medial cuneiform and first metatarsal bones of the foot. Choice B is the origin of tibialis anterior, the upper half and lateral condyle of tibia. Choice C is the origin of soleus, the fibula and medial border of tibia. Choice D is the insertion of soleus, the tendo calcaneus. When you finally walk through the doors of the testing center (calmly, because you are not late), sit down in front of your assigned computer and begin your exam, the timer starts. Some questions may be short, or they can be long, with four long answer choices. Imagine that scenario for a second. How does it make you feel? Some members of Massage Exam Academy have finished their MBLEx it 26 minutes. There are people that excel at exams and are unfazed by that timer in the right-hand corner, telling them how much longer they have left. I also have talked to people that have run out of time on the MBLEx. Do you know what happens if time runs out? You fail. Even if you have answered 99 questions correctly. It will not matter; you must answer all 100 questions. If you are a slower reader, have learning disabilities (like dyslexia or ADHD), or struggle with exam anxiety – 100 questions in 120 minutes can be difficult. Time and time again, feedback from members states that our timed simulations were the #1 reason they passed the MBLEx. This is one of the best study tactics for all of the nervous test-takers out there. Even if you don’t typically have exam anxiety, there is a chance that you will be nervous just from the pressure of such an important exam. The more you can replicate the feeling and pace of the exam, the better prepared you will be to perform during the actual exam. Not all anatomy books have the same origins and insertions. That is because not all anatomists agree and because we all don’t have the same exact origins and insertions. In the history of Massage Exam Academy, I can only think of one person that failed the MBLEx after averaging over 70% on their practice quizzes and exam simulations. I had numerous conversations with the person, and it was clear this person was very intelligent. I needed to know what happened with their exam, and how to help them with their next attempt. Were they sick? Did they memorize questions? Did they have anxiety? I looked back at their emails and noticed a pattern. Well, they all are correct. There are different ways to answer this question. If we best have to describe it, the posterior surface of the calcaneus via the Achilles tendon. But that exact wording may not be an answer option on your exam! Do not overthink these small differences, or expect everything on your exam to come from one source, which exactly matches every other resource used to write the exam questions. Do not just go by what someone told you about the MBLEx. They may have taken the exam years ago, before the exam changed. Take the responsibility to learn about the current MBLEx exam, not just the exam material. The MBLEx now uses Computer Adaptive Testing (CAT). If you do not know what a CAT exam is, you need to read this article on computer adaptive testing. Really. Read it. You should also be familiar with the current content outline from the FSMTB. This way, you know how many questions to expect in each category and whether or not the exam includes any questions on Asian theory. If you start reviewing for your exam and come upon something you didn’t learn about school, like special tests, calm down. Are there going to be questions about this subject on the MBLEx? Well, the truth is, maybe. Each exam given is unique, so it’s impossible to say exactly what is on your exam. But that does not mean we need to study and learn everything in all the books. You cannot and will not learn it all. It is impossible so don’t try to do it. No matter what and how much you study, you will have a question on your exam that will be something you may not be familiar with. I want you to know that so you do not panic when it happens. In order not to be overwhelmed, spend a majority of your time studying those seven sections of the MBLEx to the best of your ability. If you come across a unfamiliar topic that is not on the content outline, take a little time to review it. Do not spend all of your time learning about every new and obscure topic, of which, you may only have one question about on your exam. The fewer times you need to retake the exam before passing, the quicker you are able to earn money or pursue employment and business opportunities. There are lots of resources out there to help you prepare for the exam. Try not to get too overwhelmed by all the choices. Choose one that is up to date with MBLEx changes, includes timed simulation exams, focused practice quizzes to work on your weak areas, and a study guide to help you review the content outline. You have already proven your potential by graduating from massage school. This exam the final step on your exciting journey to being a massage therapist. No one can take this exam for you. Make your plan to pass and stick to it. Thank you for reading this post! In addition to Massage Exam Academy, I provide massage continuing education at Advanced Massage Techniques. I also write specifically about barefoot massage at Ashiatsu.net, and write about more general massage topics at Massage & Bloggywork.